Chop the onion, green pepper, celery and garlic. Then slice the andouille sausage and cut the chicken thighs into bite sized pieces. Set the Instant Pot to Saute and add the olive oil. Allow it warm up for a few minutes. Brown the andouille sausage for about 5 minutes, until it is nicely browned. Then remove the sausage and set it aside for now. Stir so that it does not stick to the bottom of the pot. Add the chopped chicken thighs to the Instant Pot to brown. Brown for 3 minutes. Stir so that it does not stick to the bottom of the pot. Turn the Instant Pot off. Add the chicken broth to the instant pot to deglaze. Scrape the bottom of the container with a wooden spoon to make sure there aren't browned bits of sausage or chicken stuck to the bottom. Bits of food stuck to the bottom might cause the BURN error once the pot is brought up to pressure, so scrape it well. Add the onion, green pepper, celery, garlic, salt, Cajun seasoning, and thyme. Stir to mix the vegetables and seasoning. Add the rice and mix. Add the can of tomatoes on top of the rice, but don't stir it in, just spread it out on top. This will reduce the chance of a BURN error. DO NOT add the browned sausage. Put the lid on the Instant Pot and set it for Manual High Pressure for 8 minutes. Once the pressure cooker has finished cooking let it rest for 5 minutes, then manually release the pressure. 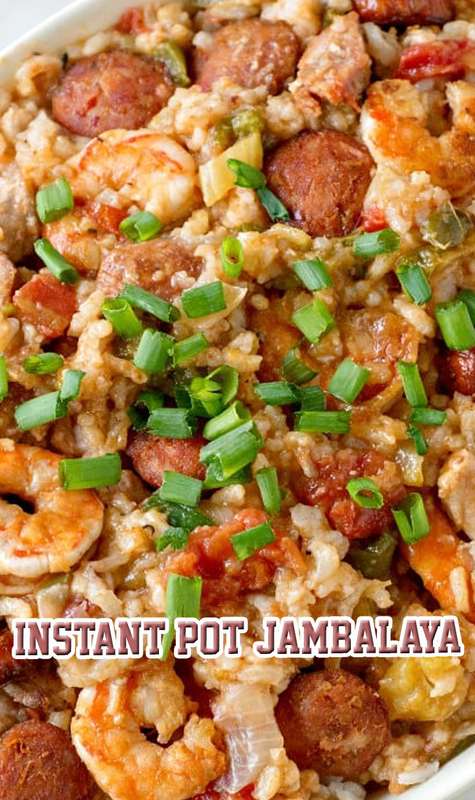 Take the lid off and stir the cooked shrimp and reserved andouille sausage into the Instant Pot. Replace the lid and let it rest for another 5 minutes to warm the sausage and shrimp.